Band comes with Apple Watch Lugs on both ends, which locks onto Apple Watch Band Interface precisely and securely. Easy to install and remove. 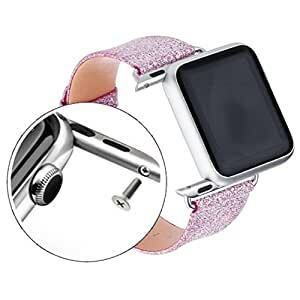 Unique 38mm Bands For iWatch – Design for ultimate comfort while offering a timeless, stylish cut and elegant looking makes it an ideal iwatch band strap replacement wristband for you. it would be a great gift for anyone & any time. Top Leather Watch Strap – Made of High quality top layer cowhide leather for the whole watchband, ultra soft & comfortable on your wrist, sweat-absorbent & wear resistance.